""With great power comes great responsibility" - Uncle Ben (Spiderman)"
This quote best summarizes the power of leverage, the ability to invest with more money than you actually have. That means if you make money from investing, you make even more money, but if you lose money, you lose even more money. The simplest way to leverage yourself is by borrowing money or taking out a loan, and then reinvesting it in hopes of making more money than you would have without borrowing. In this paper I’ll be talking about how you can open a Collateralized Debt Position (CDP) with MakerDAO in order to use leverage and go over the risks/rewards associated in doing so. There may be a lot of terms and concepts that may be new to you in relation to the MakerDAO platform, but I will try my best to explain any necessary background information you need to know. My assumption is the reader may have heard about MakerDAO and DAI, but doesn’t have a firm grasp of what it is and how it works. If you are already familiar with the project skip down to the section entitled “CDPs and creating your own DAI”. The goal of this article is to give a high-level overview of MakerDAO, DAI, and the risks/rewards of opening a CDP for leverage. Afterwards, the reader can decide if they’d like to try it out for themselves. The first place to start is the DAI token; it is a stable coin pegged to the value of the US Dollar. What that means is, it is a cryptocurrency whose value should be equal to 1 USD. That means 1USD = 1DAI. (Note: The fact that 1DAI = 1USD is actually arbitrary, 1DAI can equal 1YEN or 1EURO, but MakerDAO decided on 1USD). Another stable coin you may have heard of is Tether (USDT) which is used on many cryptocurrency exchanges. The difference between Tether and DAI are the mechanisms they use to keep the value stable. Tether keeps the value stable by backing 1Tether (USDT) to 1USD. That means for every Tether that was printed there should be an equal number of USD in a vault somewhere to back it up. The disadvantages with this approach is the possibility of fraud or manipulation because it is centralized by whoever owns the vault. If one day it is found out that there wasn’t actually enough fiat to back up the value of Tether then the price would collapse. You have to trust that the organization behind Tether has the full amount saved somewhere. In my opinion, the difference between a centralized, stable currency and a decentralized one is who has the ability to print more money. DAI can be considered a decentralized stable coin because anyone has the ability to create their own DAI. Imagine that... with the power to print your money, you become your own bank. That being said, DAI is able to stay at a stable price and give people the power to create their own DAI through some complex mechanisms that may turn some people off. Truthfully, the process is a bit cumbersome right now, but in the future I’m sure there will be user experience improvements. Most people will not have to understand the process of creating DAI. You could simply go to your favorite cryptocurrency exchange and buy DAI off of there, and 99% of people will probably go ahead and do that. With some exceptions, the price should be very close to 1USD so whether or not you create your own, or buy off of an exchange it won’t matter much to most people. As long as the currency’s value is stable, it is living up to its purpose and people can use it without understanding its mechanisms. However, if you’re reading this you probably aren’t a part of the 99%, you’re the 1% who believes in a decentralized future and want to know how to create your own DAI, so you can be your own bank, lender, escrow service, etc. First though, we’ll have to explain why a stable coin is important. Stablecoins or currencies that keep their value predictable are important for several reasons. I’ll give an example. Imagine you are a young, working, middle-class millennial who is really into cryptocurrency. After you convince your boss that the future is crypto by talking non-stop about it, they have agreed to pay half of your salary in crypto, specifically a meme-coin. Let’s say for simplicity you earned 3000 USD a month. Now you’ll get 1500 USD and 1500 worth of meme-coin. At first you think this is great because the price of meme-coin is going up so you are actually earning more than 3000 USD. However, one day there is a large pump and dump after you receive your pay and your $1500 worth of meme-coin goes down 30%. Suddenly you’ve lost $450 and can’t pay this month’s Lambo bills. Stablecoins are important because they help to mitigate the risk related to investing in cryptocurrencies. Sure you can get paid in meme-coin, but the value can appreciate or depreciate so rapidly it can be hard to come up with fair, stable prices for services and goods. This is why stable coins are important for commerce and everyday activities. In terms of investments, a common cryptocurrency trading strategy is to exchange coins that you predict will depreciate in value with a stable coin effectively locking in the price. If the price goes down you can buy back in and earn more, while if the price goes up, you technically haven’t lost money, but if you want to buy back in you’d get less of the coin than you originally had. Stablecoins also provide a great base for Fiat trading pairs on exchanges since they usually match on a 1 to 1 basis. Now we’ll talk about how DAI actually keeps its price stable and how to create your own DAI. There are different strategies for keeping a coin’s price stable. The common tactic is to back the coin’s value with something else of equivalent value. For Tether it’s fiat. For fiat it may be a precious metal like gold. When something’s value is backed by another object it can be considered as collateral. This might get a little meta, but money can be considered as a kind of debt. When you think about it, a $1 dollar bill is kind of like an IOU (I owe you). When the USA was still using the gold standard 1 dollar bill was worth $1 worth of gold, and it was an unspoken agreement that you could trade in your bills for its equivalent value in gold. After the government stopped using the gold standard in the 70’s you can’t actually do that anymore, but the concept of debt still exists. Dollar bills are still IOUs, not for gold, but for goods, services, or anything that can be exchanged in USD. Traditionally the process of printing money or creating debt is a centralized process, but MakerDAO gives you that power with CDPs and DAI. Let’s break down the process of printing money or debt. You need a mechanism to deal with bad debt. In a centralized system all 5 of these things are handled by a single authority. The reason why MakerDAO is powerful is because all 5 of these things can be managed by anybody. A type of Collateral - Gold (Before 70s). USD is not actually backed by anything anymore. Place to store Collateral safely - Fort Knox for gold, but since USD is not backed by a physical type of collateral anymore it is metaphorically stored as trust in the government. Mechanism to free debt - Government could, theoretically, remove debt it owns from circulation. Mechanism to deal with bad debt - Repossession/Liquidation of other collateral by a central authority. Mechanism to deal with bad debt - Tether doesn’t really deal with loans or bad debt. The first thing is the type of collateral. DAI is backed by Ether. That means if you own Ether you can create your own DAI. In the future MakerDAO plans to implement multi-collateral DAI, meaning you’ll be able to choose different collateral types; it won’t have to be just Ether. Earlier, I mentioned why a stablecoin may be better in some situations than a cryptocurrency like Ether due to price volatility. So, how does DAI’s price stay stable even though it is backed by something that may be unstable? That will be explained later when we explain how MakerDAO deals with bad debt. The next thing is a place to store that collateral. Tether and USD both use banks or vaults to store their collateral. DAI uses smart contracts. I will not go into what smart contracts are, as that is a completely different and larger topic, but if you don’t know what it is you can think about it as a kind of digital vault that can manage itself. Because Ether is a digital cryptocurrency it makes sense it would be kept inside of a digital vault. Smart contracts are programs that when coded correctly may even be harder to get into than a bank vault with guards and guns. The third thing you need is a mechanism to create new debt. Both USD and Tether print money centrally by a single authority. DAI on the other hand gives this power to anybody who has Ether. Remember how I said that the smart contract that holds all the Ether is kind of like a digital vault that manages itself? The digital vault not only holds the money, but manages it too. If you wanted to create DAI what you would do is go up to the smart contract/vault, let’s name it Vaulty for now, and say Vaulty I would like to give you some Ether as collateral so I can print my own debt/DAI. This process is also known as opening a Collateralized Debt Position (CDP). The Ether is the collateral and once it is locked away by Vaulty you can print your own Debt. Hence the name Collateralized Debt Position or CDP. So once you give Vaulty your Ether to lock up, Vaulty will let you create your own DAI backed by the Ether you gave earlier. The basic process is as follows, open up a CDP, lock away your Ether as collateral, and then create your own DAI. If you want to create more DAI, then you have to lock up more Ether. If you can create debt, then you need a way to clear debt as well. With USD it seems we are always deeper and deeper in debt every year, so I’m not sure there is a mechanism for this, but theoretically the government could reduce inflation by removing debt or fiat it owns from circulation. For Tether the organization can buy back Tether off the exchange then burn the token. If they buy Tether on an exchange when it is below 1 USD they can even make profit. That sounds too good to be true, but anybody can do the same thing with DAI as well. With DAI anyone who created debt can free it up. All you have to do is return the DAI you created to Vaulty. At that point you can even ask Vaulty to return you the Ether you locked up. The way MakerDAO created DAI was to incentivize users to keep the price stable at 1USD by creating profit-making opportunities when the price is not 1USD that will drive the price toward that number. If DAI’s price on an exchange is below 1USD that means you can make profit buying DAI, which will drive the price back up toward 1USD. Then you can pay back your CDP debt at a discount earning you profit. If DAI’s price on an exchange is above 1USD, you can create more DAI from your CDP (which will always be 1DAI = 1USD) then sell it on the exchange for a profit, driving the price back down toward 1USD. An important thing to note is there is a small fee associated with MakerDAO to close or pay down a CDP. This is called the Governance Fee and it is currently set to a 0.5% APR which is incredibly low when compared to traditional APR rates of conventional debt like credit cards which can have APR rates greater than 20%. Traditionally, bad debt is the inability to pay back what you owe. In those scenarios the lender would repossess and liquidate assets owned by the lendee. This can be scary for several reasons. The lender can lay claim to other assets as collateral and then liquidate them at the expense of the lendee. The other downside is it can affect the ability to borrow more debt in the future. Centralized systems try to keep their assets safe by assessing the risk associated with doing business with an individual or organization. You may have heard of credit scores. If you are unable to pay a debt back this has long term effects on your ability to borrow more debt in the future. One of the advantages of MakerDAO is inability to deal with a debt will not affect future attempts to use the platform. MakerDAO doesn’t use things like Credit Score and doesn’t care if you failed to keep a healthy CDP several times (please maintain a healthy CDP for your own sake). As long as you have ETH you can create DAI. That being said, DAI has a liquidation process that borrowers have to be aware of. The primary risk of owning a CDP is if the value of the collateral goes down. This is true of currencies, like DAI, where the collateral has a value that can appreciate or depreciate over time. The reason why the value of collateral going down is bad is because it lowers the value of the currency. For example, let’s say 1 ETH costs 100USD and 100DAI was created backed by that 1ETH. If the price of ETH goes down by 10% to 90USD and 100 DAI was already created that means each DAI will be worth 0.90USD and not 1USD anymore. Since the value of ETH is volatile a MakerDAO CDP will not let you create DAI at a full one to one ratio of the value of your ETH in case something like this happens. Something else to understand about the MakerDAO CDP is that it is a kind of loan you don't have a schedule to pay back on. The only time you have to pay debt back is to prevent the value of the collateral going below the amount of DAI created from the CDP. In a traditional system the inability to pay back the bad debt is to liquidate the collateral or repossess assets owned by the lendee. This process is done by a central authority like the IRS or a bank, but with DAI the liquidation process can be done by anyone. MakerDAO incentivizes people to keep the price of DAI stable by creating profit opportunities to keep the price stable at $1USD. When bad debt is introduced into the system it will make the system less stable and may make it harder to redeem 1DAI for 1USD in collateral. To deal with the potential of bad debt MakerDAO has created a profit opportunity for peers to liquidate CDPs that don't meet the safe liquidation percentage (150%). Liquidation is done through peer enforcement and bots created to make profit by closing out bad debt. The advantage of this mechanism is the clear rules for liquidation. The disadvantage is it is almost 100% certain you will be liquidated and it will happen at the exact moment you are below the safe liquidation rate. You will not receive letters in the mail, second chances, or 30 day opportunities to get the debt in good standing. Due to the profit opportunities, peers and bots will liquidate every time they get the chance to. To summarize you can't be liquidated for no reason, but if you do it will be certain and instant. This is one of the most important concepts and is where a lot of the “risk” part of leverage is involved. Logically, you might assume if the price of Ether is 100$ USD and you give Vaulty 1 ETH to lock away, you can ask Vaulty to print 100 DAI. This is not true. The reason for this is the possibility that Ether’s value could go down. For example, if Ether’s price goes down 10%, now there is only 90$ worth of ether locked up for the 100DAI that was created. So instead of being able to draw out 100% of the Ether’s value that you locked up, the MakerDAO organization created a liquidation ratio that limits the amount of DAI you can create before the possibility of being liquidated by someone else. What does that look like? Imagine 1 ETH is worth 100 USD. To calculate the max amount of DAI you can mint, you can do some basic algebra. Take the current value of your ETH (100) and divide it by the liquidation ratio of 150% (1.5). 100/1.5 = X. Where X is maximum amount of DAI you can mint. Therefore if you locked up 1 ETH at 100 USD you can draw a maximum of 66.67 DAI before being liquidated. Liquidation occurs when the ratio goes below 1.5. So let's take a look at the liquidation ratio if the price of ETH goes down by 10% to 90 USD. 1.64 is above the 1.5 liquidation ratio which means the CDP will not be liquidated and in fact, more DAI can be created. The easiest way to keep track of a healthy CDP is to keep track of the value of ETH. When you create a CDP on MakerDAO and create DAI it will tell you at what price ETH will need to drop to before you get liquidated. 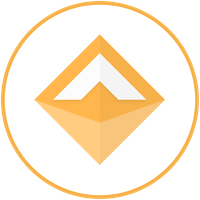 If you are ever at risk of being liquidated you can return DAI back to the CDP or lock away more ETH. This is a simple overview of the liquidation process for more detailed information please refer to this post or the official white paper. If you do decide to open a CDP you can also play with the values in the CDP simulator. Make sure you don’t get liquidated by monitoring your liquidation ratio or the price of ETH.If you want to see what this actually looks like in the MakerDAO platform you can access the DAI Dashboard or view the video below. Earlier I stated that leverage is being able to invest with more money than you actually own. So now the question is how do you do this with MakerDAO and DAI? Remember, you can only create enough DAI from your CDP so that your position is not liquidated. If you reinvested the DAI to buy more cryptos that would mean you would be investing with less money than if you had just used ETH as your trading pair, but what if you instead used the DAI you created to buy even more ETH? This is the mind-blowing part. You can lock away your ETH so you can create DAI, then use that DAI to buy more ETH, then lock that ETH away so you can create more DAI, which you use to buy more ETH so you can lock it up to create more DAI, and so on and so forth. Isn’t that incredible? Take a look at the example below to understand what this process looks like and how it can make you more money than just holding. Please note this example is very simplified, in practice it would be hard to do all this manually and without delay to capitalize on price changes. From the example you can see that you can earn more potential profit from leverage. If we wanted to make even more profit, we could’ve taken the 0.5 ETH we bought with 50 DAI, locked it up into the CDP, created even more DAI, and repeated the steps multiple times. An important thing to note about this strategy is it will not create infinite money or leverage. The reason for this is because the amount of DAI you can create on each cycle is less every time. If you like math, you’ll realize this is actually a finite geometric series. Ian Macalinao wrote a great article where he does the math to check the maximum amount of leverage you can actually create with MakerDAO. The TL;DR is, if you keep reinvesting the DAI you created the maximum leverage you can create without going below the liquidation ratio is 3x. That means if you had 1ETH, you can end up with 3ETH's worth locked up between your CDP and in DAI you created. That being said 3x is not realistic because if the price of ETH goes down even a little you’ll instantly be at risk of being liquidated. A more conservative estimate would be 1.5x-2x. Here is where risk and reward come into play. Leverage is a double edged sword because it is a multiplier and it works in both directions. When you use leverage to invest you can make more money faster and also lose money faster. The biggest risk of opening a CDP with MakerDAO is being liquidated, and that happens when the value of your collateral goes down (price of ETH). However, the greatest rewards come when the value of your collateral goes up because then you profit more than you would have if you just held. "“Never invest more than you’re willing to lose.” - Somebody on Reddit, 4chan, or wherever else cryptos are discussed." Possibility of greater profit than if you just held. Possibility of losing more money than if you just held. 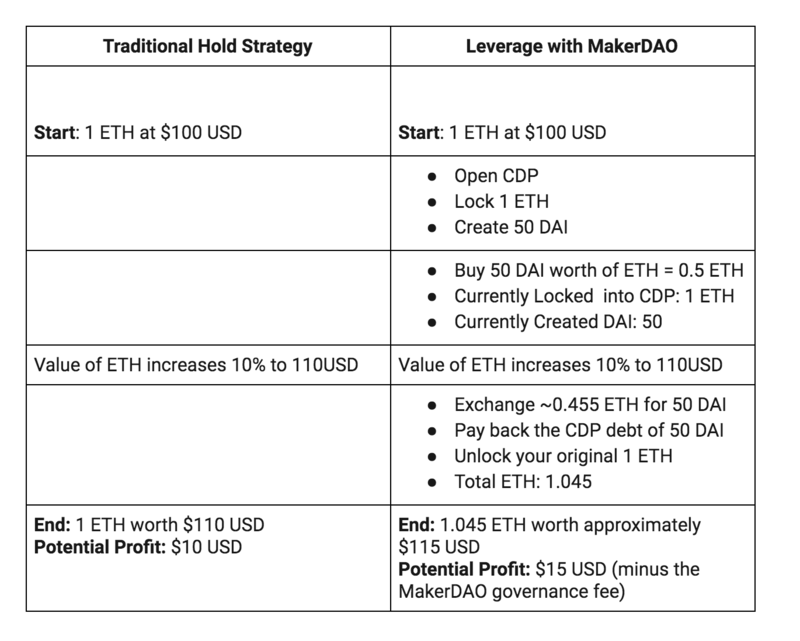 In the context of using MakerDAO and DAI here are the pros and cons compared to other leverage platforms. The last thing I want to write about is that MakerDAO and the process of creating DAI can be used for more uses than just leverage. MakerDAO gives you the ability to be your own bank. That means anywhere you need a low interest loan or a stable coin you can use DAI, leverage is just one use case. Please check out this medium article created by MakerDAO to get more ideas of how you can use MakerDAO. If you decide to use MakerDAO for leverage I wish you the best of luck, but please remember.